Country and pop fans everywhere are excited about Taylor Swift fans are excited about her tour for her new 1989 album. The singer/songwriter is known for her spectacular shows that specifically showcase her songs, writing style, and personality. Swift will plays variety of instruments and perform songs from her new album such as ‘Shake it Off’, as well as her biggest hits and fan favorites. 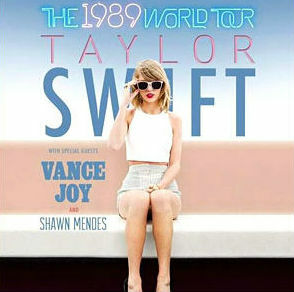 Taylor is touring with Vance Joy and you can bet the 1989 World Tour will be one of the biggest tours this year! Get your tickets online to see Taylor Swift or order tickets by phone.